Acute kidney injury (AKI) and acute lung injury (ALI) represent serious complex clinical problems, especially when they occur together. In-hospital mortality for acute lung injury, for example, nearly doubles in the presence of acue kidney injury, indicating clinically relevant lung-kidney interactions. AKI was originally described as the abrupt loss of kidney function causing retention of waste products as well as dysregulation of acid-base, electrolyte, and fluid homeostasis. The recent development of two related classification systems has allowed for a more standardized, precise definition and staging of acute kidney injury. 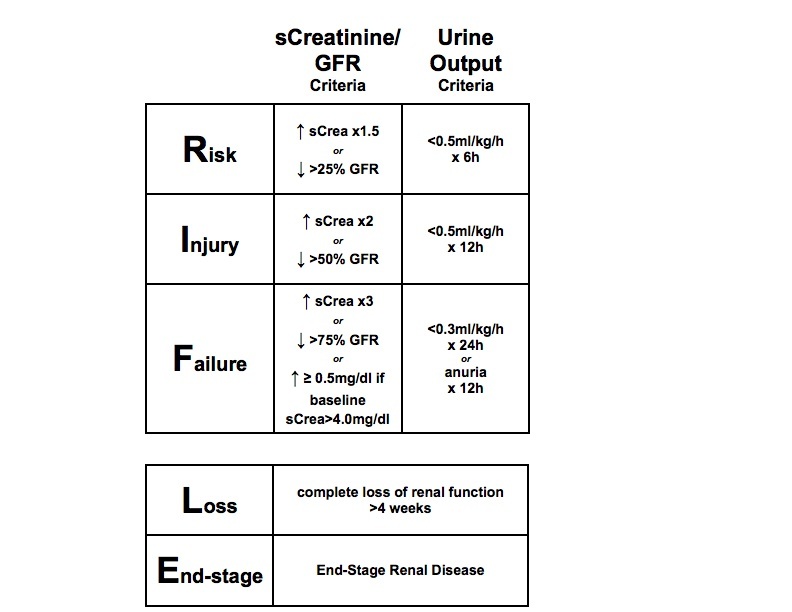 Both the Acute Kidney Injury Network (AKIN) and the “Risk, Injury, Failure, Loss, End stage” (RIFLE) need only two very basic clinical parameters, urine output and changes in serum creatinine concentration. ALI represents a life-threatening form of acute respiratory failure. Although knowledge and understanding of lung-kidney interactions are rapidly growing, clinical management of this devastating scenario is still limited to supportive care of their respective organ injury or failure. Current clinical care is limited to supportive measures of AKI and ALI, respectively. AKI can be diagnosed and staged according to the RIFLE or AKIN classifications (Figure 1 and Figure 2). Diagnosis and staging of AKI according to the RIFLE classification. Diagnosis and staging of AKI according to the AKIN classification. Not available at this time. Supportive treatment for AKI and ALI, including renal replacement therapy and lung-protective ventilation. The crosstalk between AKI and ALI results from both direct loss of normal organ function and inflammatory dysregulation associated with each organ failure. Cellular as well as soluble mediators contribute to the inflammatory dysregulation in this setting. AKI can affect lung function in numerous ways. The effects of AKI on the lung go beyond those that can be expected from the typical clinical complications of AKI (e.g., hyperkalemia, fluid overload, pericarditis). In the healthy lung, experimental AKI induces inflammation and apoptosis, increases pulmonary vascular permeability, and causes erythrocyte sludging in lung capillaries, interstitial edema, focal alveolar hemorrhage and inflammatory cell infiltration. Experimental AKI also leads to down-regulation of epithelial salt and water transporters, causing decreased alveolar fluid clearance. During ALI, however, AKI exerts anti-inflammatory effects towards the lung. AKI impairs crucial steps of the leukocyte recruitment cascade in both experimental and clinical studies, providing plausible explanations for the clinical observations that patients with AKI have worse outcome from infectious diseases than patients without AKI. In experimental studies, AKI worsens bacterial pneumonia by means of impaired neutrophil recruitment and subsequent increase in bacterial load. ALI affects renal function in different ways. – Hypoxemia as well as hypercarbia and acid-base disturbances resulting from ALI give rise to a release of vasoactive substances, such as endothelin, angiotensin, and norepinephrine. The resulting vasoconstriction decreases renal blood flow. – Mechanical ventilation itself has substantial effects on systemic and local hemodynamics. It can reduce venous return, pulmonary vascular resistance, and cardiac afterload and ultimately cardiac output. Mechanical ventilation also redistributes intra-renal blood flow and activates hormonal and sympathetic pathways. As a consequence, creatinine and free water clearance and sodium excretion decrease. In addition to direct mechanical effects, mechanical ventilation also causes the so-called biotrauma of the lung during ALI. ALI-associated biotrauma is characterized by local and systemic release of inflammatory mediators, including TNF-a, IL-1b, IL-6, and IL-8. Lowering the pre-set tidal volumes (“lung-protective” ventilation) has reduced not only the overall morbidity and mortality from ALI but also the incidence of remote organ injury/failure, such as AKI. Lung-protective ventilation now represents a cornerstone in the management of patients with ALI. – Pulmonary inflammation arising from ALI itself can also cause remote organ failure. Both experimental and clinical studies have shown that bacterial ALI (pneumonia) can lead to AKI even in the absence of mechanical ventilation or overt shock. Under these circumstances, pro-inflammatory cytokines as well as activation of coagulation seem to play a role in the development of AKI. Nearly 70% of all critically ill patients develop AKI. About 75% of patients with severe AKI require renal replacement therapy (RRT). Patients who require RRT have an in-hospital mortality rate of 60%, and less than 50% of these patients recover renal function. ALI has an age-adjusted incidence of 86 per 100,000 person-years and carries an in-hospital mortality rate of up to 38%. The development of AKI in the setting of ALI increases the in-hospital mortality rate to almost 60%. AKI and ALI remain major clinical challenges, especially when they occur together. Both clinical and experimental studies strongly suggest clinically relevant kidney-lung interactions. Current clinical strategies do not offer therapeutic intervention but rather preventive or supportive measures. As for AKI, treatment is limited to adequate volume control, correction of acid-base/electrolyte abnormalities and elimination of uremic substances by RRT. Lung-protective ventilation is a cornerstone in the management of ALI, as it minimizes both the direct mechanical effects of ventilation and the inflammatory response arising from ALI and mechanical ventilation. To improve outcome, future research needs to focus on organ crosstalk, as multi-organ failure not only is the sum of loss of organ functions but also includes inflammatory dysregulation and its consequences. “Ventilation with lower tidal volumes as compared with traditional tidal volumes for acute lung injury and the acute respiratory distress syndrome. The Acute Respiratory Distress Syndrome Network”. N Engl J Med. vol. 342. 2000. pp. 1301-1308. Bellomo, R, Ronco, C, Kellum, JA, Mehta, RL, Palevsky, P. “Acute renal failure – definition, outcome measures, animal models, fluid therapy and information technology needs: the Second International Consensus Conference of the Acute Dialysis Quality Initiative (ADQI) Group”. Crit Care. vol. 8. 2004. pp. R204-12. Mehta, RL, Kellum, JA, Shah, SV, Molitoris, BA, Ronco, C, Warnock, DG, Levin, A. “Acute Kidney Injury Network: report of an initiative to improve outcomes in acute kidney injury”. Crit Care. vol. 11. 2007. pp. R31-9. Hassoun, HT, Lie, ML, Grigoryev, DN, Liu, M, Tuder, RM, Rabb, H. “Kidney ischemia-reperfusion injury induces caspase dependent pulmonary apoptosis”. Am J Physiol Renal Physiol. vol. 297. 2009. pp. F125-137. Hoke, TS, Douglas, IS, Klein, CL, He, Z, Fang, W, Thurman, JM, Tao, Y, Dursun, B, Voelkel, NF, Edelstein, CL, Faubel, S. “Acute renal failure after bilateral nephrectomy is associated with cytokine-mediated pulmonary injury”. J Am Soc Nephrol. vol. 18. 2007. pp. 155-64. Imai, Y, Parodo, J, Kajikawa, O, de Perrot, M, Fischer, S, Edwards, V, Cutz, E, Liu, M, Keshavjee, S, Martin, TR, Marshall, JC, Ranieri, VM, Slutsky, AS. “Injurious mechanical ventilation and end-organ epithelial cell apoptosis and organ dysfunction in an experimental model of acute respiratory distress syndrome”. JAMA. vol. 289. 2003. pp. 2104-2112. Liu, KD, Matthay, MA. “Advances in critical care for the nephrologist: acute lung injury/ARDS”. Clin J Am Soc Nephrol. vol. 3. 2008. pp. 578-586. Ranieri, VM, Giunta, F, Suter, PM, Slutsky, AS. “Mechanical ventilation as a mediator of multisystem organ failure in acute respiratory distress syndrome”. JAMA. vol. 284. 2000. pp. 43-44. Rossaint, J, Spelten, O, Kässens, N, Mueller, H, Van Aken, HK, Singbartl, K, Zarbock, A. “Acute loss of renal function attenuates slow leukocyte rolling and transmigration by interfering with intracellular signaling”. Kidney Int. 2011. Singbartl, K, Bishop, JV, Wen, X, Murugan, R, Chandra, S, Filippi, MD, Kellum, JA. “Differential effects of kidney-lung cross-talk during acute kidney injury and bacterial pneumonia”. Kidney Int.. vol. 80. 2011 Sep. pp. 633-44. Murugan, R, Karajala-Subramanyam, V, Lee, M, Yende, S, Kong, L, Carter, M, Angus, DC, Kellum, JA. 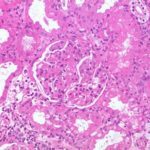 “Acute kidney injury in non-severe pneumonia is associated with an increased immune response and lower survival”. Kidney Int. vol. 77. 2010. pp. 527-35.